WSU’s International development experts are working with villagers in the Afghan province of Laghman to help stabilize the communities after years of drought and conflict. Outfitted with disposable cameras, the villagers, farmers, and business owners collected these snapshots of their daily life. The people of Laghman province in eastern Afghanistan suffered through a severe drought from 1997 through 2001. On top of years of conflict, the drought took an enormous toll on its people. Farmers sold off their cattle as the drought worsened, unable to grow forage or grain to feed them. Then they sold the sheep, then the goats. Without adequate irrigation, fruit and nut trees withered and died. By the time the drought eased, Laghman province farmers had lost 70 percent of their livestock. Milk and cheese had traditionally been a major source of protein, and cows served as draft animals as well as providing milk and occasional meat. But cows are very expensive. To recover financially, many of Laghman's farmers turned to another traditional product, opium poppies. Following the fall of the Taliban, Afghanistan once again became the world's major producer of opium poppies. When Chris Pannkuk, director of International Research and Development at Washington State University, first started investigating the potential for a program to provide farmers in Laghman province alternatives to poppy production in 2004, an estimated 85 percent of the province's arable land was planted in poppies. But when he returned the following year, the poppies were gone. Apparently, provincial authorities had decided to ban opium production. Whether it was a gesture toward attracting foreign aid or an economic move to bolster opium prices was any Westerner's guess in this difficult to penetrate society. But the poppies were gone, just like that. Pannkuk '94 Ph.D., with the help of the Danish Committee for Aid to Afghan Refugees (DACAAR), a non-governmental organization working in the area since the Soviet occupation, moved ahead with his survey work. Left without reliable income, provincial farmers could replant poppies just as quickly as they'd stopped. A byproduct of opium production is a poppy-seed cake that is dried and fed to cows, or replanted if need be. 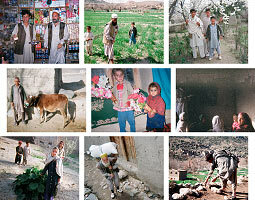 Pannkuk worked with Vic Getz '05 Ph.D. to survey the residents of three Laghman villages. Back in Pullman, Dana Moore, of the WSU Social and Economic Sciences Resource Center, compiled and analyzed the results, determining the needs of the residents and how to best meet them. The survey was extensive, in order to engage the communities. The most pressing losses from the drought, they concluded, were fruit and nut trees and cattle. Pannkuk developed a prioritized list of projects to present to the village elders. But then a funny thing happened, says Pannkuk. He met with village elders to discuss the conclusions of the survey. Gathered around a mulberry tree, they discussed the needs of the villages. The survey had clearly revealed that the most promising project would be a nursery, for propagating fruit and nut trees. Such a community enterprise would help spread out wealth and, suggested the survey, help rebuild a strong economic base. The elders were very polite and listened patiently, says Pannkuk. But at the end, he says, every one of them said "That's a very good idea, Mr. Chris. But really what we need are cows." So Pannkuk went back to the drawing board and came up with a plan to reintroduce cattle. With DACAAR, he organized a cattle association and a plan for distributing cattle where most needed. They also formed a women's cheesemaking group, introducing more hygeinic methods and the use of citric acid to curdle the cheese, providing an approach much quicker than the traditional one. Another project that grew out of the survey and community was forest management, including expansion of improved fruit and nut varieties as well as woodlots. Sixty thousand poplar cuttings were distributed. The trees were planted as borders and in woodlots, for firewood, construction, and other uses. The "Village Decision Driven Research Project," as it is officially known, is now concluded and considered a success. Wheat has once again replaced poppies, and the people are feeding themselves rather than buying food with opium profits. WSU's International Research and Development program has a long history of such development work and is currently involved in a dozen projects on four continents. It is currently working with a consortium of universities in training Iraqi agricultural extension workers. It also developed a project in western Afghanistan to raise saffron rather than opium poppies.